Nina’s Baby Shower took place this weekend, organised by my party planning company I Love Festa. It was a pink and grey, owl themed party with some chevron details. Check out the details and photos! Nina’s baby shower had tones of sweets, including delicious cupcakes (decorated with fondant owls, birds and little houses), cake pops and Brazilian brigadeiros. The mother couldn’t decide between two cakes, so she had both: chocolate, Kit Kat and strawberries cake and carrot cake with chocolate icing (both baked by me at Bolos da Cíntia). 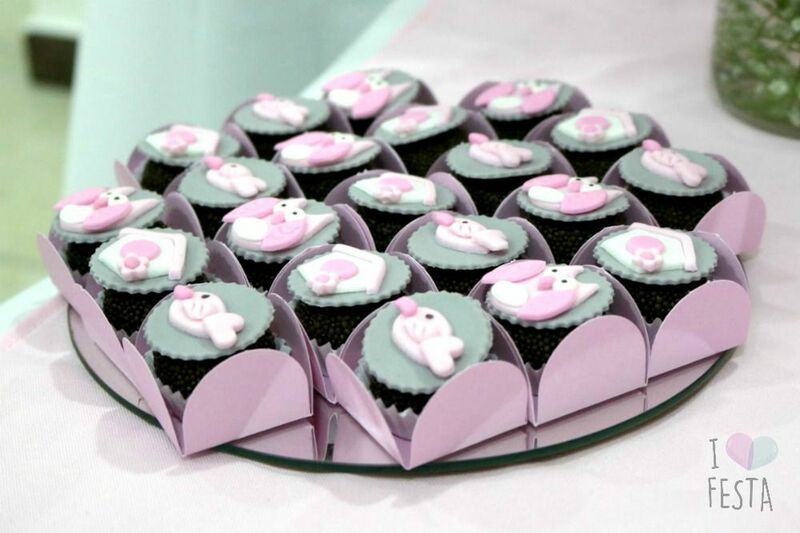 The baby shower decoration had white sweets stands, a mirror tray and white and pink table cloths. There were two tables. The taller one had a beautiful diaper “cake” and the small one, an owl pillow and wood letters painted in pink and decorated with pearls forming the name of the baby, Nina. Behind the table, there was a chalkboard and, on each side, there were helium baloons. The menu included finger finger foods like mini-sandwiches, quiches and bruschetttas, and individual canned and bottled drinks. We also made a customised paper set, with naming tags, baby bingo sheets and hashtag cards. Photos: Cíntia Costa and Daniela Fiaschi.